Your Member Portal allows you to manage a community of customers, as well as receive workspace bookings or invoice payments. Your customers can easily interact with each other in a community environment, view their contract and billing information, pay their invoices online, book space, order services and more. Contacts may be added to your Portal automatically, when they join your customer base (Please read more about this here); but also manually; as we will be discussing within this guide. Contacts may be added both by you as the Operator, as well as by your customers. How do you add new members? Make sure you create an Account record for your customer within Operate. Make sure the person you need to add as a Portal member is added as a Contact. Check your email templates to ensure that the information you send to the Contact is correct. Send an Email invite to the Contact. How do your customers add new members? Your customers can add members using the Manage Users feature, right from within their Portal accounts. So, someone you add first can in turn send further invites. Let's look at both of these situations in detail! Your customer's organization has an Account created in Operate - Go to Member > Accounts and search for the name of the customer organization to which your Contact belongs. If there is no Account created for them, then please create one, following the guide on Adding a Customer Account. The person you need to add has a Contact record created in Operate, under the customer organization's Account - Check your existing Account record, if there is one, and see whether the person you would like to invite to the Portal is added as a Contactr under this Account record. If not (or if you are creating the Account from scratch) then please add the Contact record as well, as shown in Creating Contacts in essensys Operate. On any existing or new Contact record, please make sure that the Community Status field is set to Active. In addition, please set the Portal Access Level to the one you'd like to allow to the new member. Find out more about the features available for each. 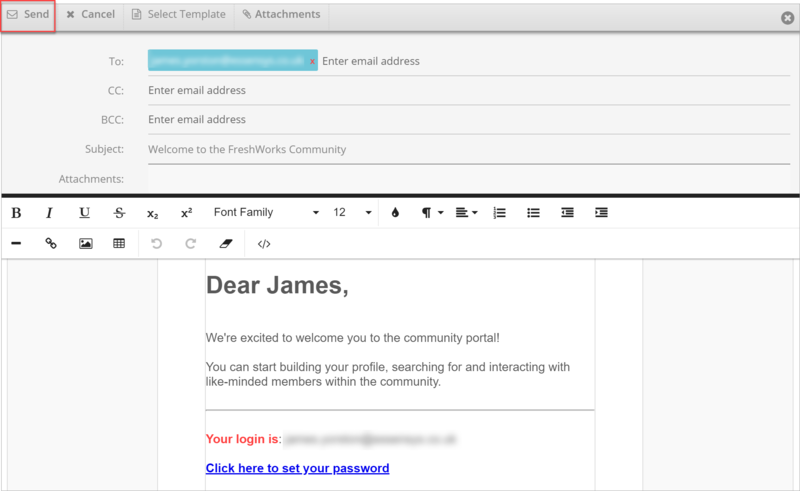 The email template that you are most likely to use is called Invite Members to Portal and is available under Settings > General > Templates > Email Templates > Portal Community Notifications folder. To check/edit this template or create a new one for this purpose, please see Creating Email Templates in essensys Operate. Once your Contact record has been created and you know that your Email Template is accurate, you can proceed to inviting your Contact. Start by going to Member > Contacts. Search for the contact you need, using the Filter box on the right. Click the name of your Contact to access their record. Double check their email address if needed. Click Send Email, on the right hand side of the page. 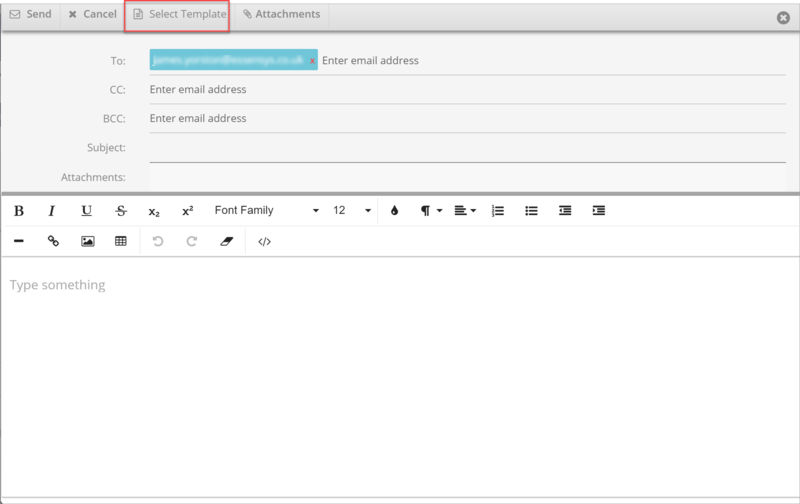 The email editor opens and you can then proceed to selecting an email template. Click Select Template to do so. In the email templates area, use the Search field to find your Invite Members to Portal template (or any other template you may be using for this purpose). Simply type a keyword in the search box and hit Enter/Return. Click the name of the template you want to use and Operate will insert it into your email editor. Review the email message and make any required changes. Hit Send to invite your member to the Portal. The new member will then be able to log in at your Portal's URL address, using their registered email address and password. 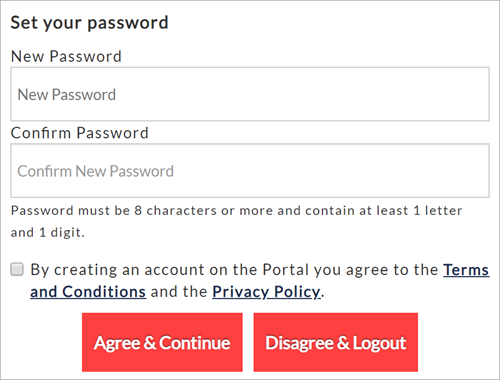 To be able to invite other users, any customer needs to be given access to the Portal first. This can be done automatically, or manually, as described in the section above. These members will automatically receive the template called Welcome email to a new client - also found under Settings > General > Templates > Email Templates > Portal Community Notifications folder. Please check this template as well, to make sure it meets your requirements. In addition, please add the "[EMAIL]" merge field to the 'To' box if it is not filled already. This ensures that the template will get sent to newly invited users automatically, once the invite is completed (as we will discuss below, in Step 3). To learn more about how to check/edit this template please see Creating Email Templates in essensys Operate. Customers can add their own users to the Portal, without you needing to intervene. Go to the portal URL address and log in with username and password. Select the user name on the main menu bar and choose Manage Users. Here is where a list of current portal users is available, along with options to edit, delete, search or invite users. Read more about Managing Portal users. Click Invite User to proceed. Enter the user's details - title, first and last name and email address. Select the user's access level - Basic, Mid or Admin. Learn more about portal access levels and permissions. Users invited using this option will be marked as such within their Operate Contact record, where the Invited from Portal field will be set to true (the checkbox will be checked).